Who’s your Inner Baby? What do you love to do? 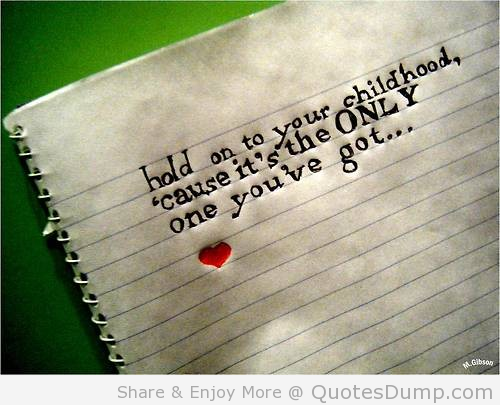 We have all read and heard a lot about our Inner Child. But what about our Inner Baby? Much gets lost in translation between Babyhood and Toddlerhood. And on it goes. Toddlerhood and Tweenhood. Tweenhood and Teenhood. Teenhood and Adulthood. Some sense of autonomy or responsibility or conscience or something escalates our levels of self-doubt into radical stages of us double-guessing ourselves. We gain in experience while our increased awareness of Other lends to added confusion of Self. I am not a psychologist. I have not researched what happens to us developmentally while we are growing and being alive. But I do wonder where my Inner Baby went to. It is as if something really innocent does get lost as the expectations of society are incrementally imposed. My sense of spontaneity gets diverted into embracing the ways of politesse. My sense of joyful random has been funneled into sit-up-straight-and-behave. Am I the only one that feels this way? For example, am I the only one who still gets in trouble every time I go to the museum? I don’t understand this phenomenon, but every. single. time. I go to the museum, I get scolded for something. That door isn’t an exit. Don’t get too close to the painting. Don’t touch the painting. Step away from the sculpture. Don’t take a picture. Now. I do know that the doors that are marked in bright red as fire exits are not the acceptable way to locate the restroom. And I know that breathing on and touching paintings are taboo. And while I might be checking my phone for the time, it does not follow that I am going to aim and shoot with a damaging flash. It is really kind of exhausting. Someone once told me that the reason that I get scolded is that I have long, curly hair. While I am open to this theory, I do believe that there is something else — perhaps some kind of mischief vibe — that I am giving to the museum’s VSRs. Maybe it is my Inner-Baby vibe being unleashed without me even realizing it? It is for the betterment of society that we learn these rules of etiquette. What a crazy mob scene life would be if we didn’t have this cultural structure to monitor our words and our actions. But. I watch this video, and I can see my inner child being mirrored back to me when I am doing something that I love that is fun and spontaneous. I love to dance, so this video speaks to me very vividly. And I can see my Inner Baby when I get out there on the dance floor and shake it. What is it that you see yourself doing in front of a magic mirror such as the one in the video? I will refrain from MoonWalking my way through Chihuly’s glass series the next time I go to the museum, but I am going to have a good laugh imagining myself doing so past the docents and the stationed visitor reps. Time to unleash my Inner Baby and have some fun!